Please join us TOMORROW for an evening of food, beverages, and Springs education! 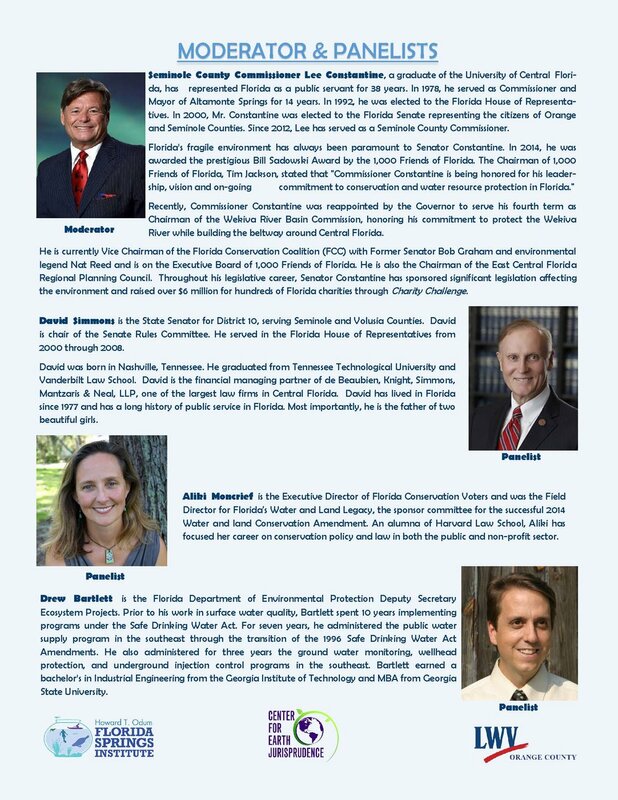 The Center for Earth Jurisprudence, the Howard T. Odum Florida Springs Institute, and the League of Women Voters of Orange County, Florida invite you to join us for a free informational program on restoring the Wekiva River and Springs. The event will feature speakers on current springs science and policy. Dr. Robert Knight, Executive Director of the Howard T. Odum Florida Springs Institute, will kick off the forum with an update on the science and current environmental health of the Wekiva River and Wekiwa Springs. Margaret Stewart, Director of the Center for Earth Jurisprudence, will address current springs protection laws and what progress has been made to restore our local springs. The event will conclude with a panel discussion featuring local and state leaders on water initiatives for the upcoming 2018 legislative session. Cocktail hour begins at 5:30 p.m. Please register at lwvoc.org. We hope to see you there! Newer PostCocktails, Hors D'oeuvres, & Springs Talk!